Tiangong 1 is China’s first Space Station Module that is the nation’s first step towards its ultimate goal of developing, building, and operating a large Space Station as a permanent human presence in Low Earth Orbit. The vehicle was launched on September 29, 2011 aboard a Long March 2F Launch Vehicle. 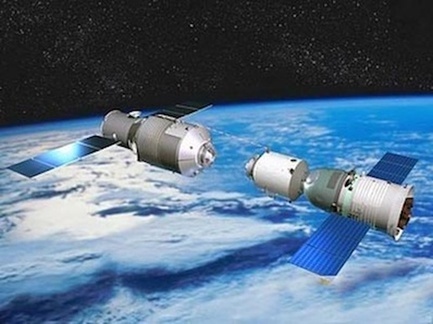 The Space Station Module is planned to welcome 3 visiting vehicles, the unmanned Shenzhou 8 test flight to demonstrate Rendezvous and Docking technology and the manned Shenzhou 9 and 10 missions that will utilize Tiangong 1 for experiments and tests associated with ‘living in space’. 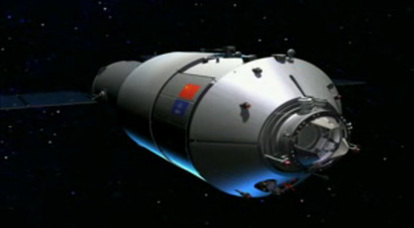 Tiangong 1 is planned to be deorbited in 2013 and replaced by Tiangong 2, a larger, more sophisticated Space Laboratory. 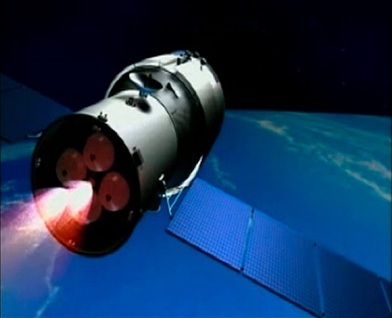 Tiangong 3 will follow by 2016 to prepare the final steps on the way to a large Station in Low Earth Orbit. Chinese Officials have indicated that their new space station will be as big as the US Skylab Space Station that orbited Earth in the 1970s. This large station is expected to open for business by 2020 – according to Chinese sources. Tiangong means Heavenly Palace. Tiangong-1 orbits Earth at 330 to 370 Kilometers with an inclination of 42 degrees. 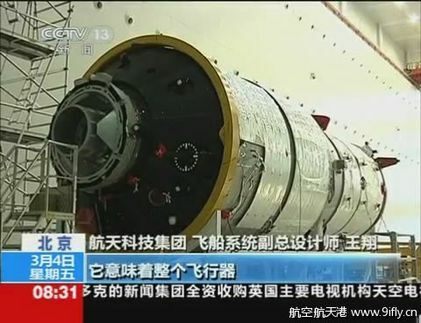 The Tiangong Service Module is based on that of the Shenzhou Spacecraft. It provides electrical, environmental control and propulsion subsystems. It is cylindrical in shape, about 3.3 meters long and 2.5 meters in diameter. Two solar arrays are mounted on the exterior of the module. Each array consists of four panels and is about 3.1 by 10 meters in dimension. The solar arrays provide an average power of 2,500 Watts with peaks of up to 6kW. Sun sensors are used to automatically rotate the arrays for proper Sun exposure. With its arrays deployed, Tiangong 1 has a span of 23 meters. Silver-zinc batteries are also located in the aft section and provide power when the vehicle passes through orbital night. Similar to Shenzhou vehicles, Tiangong 1 operates on a 28-Volt power bus. The main propulsion system features two high-expansion-ratio main engines using Monomethylhydrazine and Nitrogen Tetroxide as propellants. Eight vernier jets at the base of the module are used for fine-maneuvers. Four sets of two Reaction Control Engines are mounted on the external base of the Service Module and are used for pitch and yaw attitude control maneuvers. Roll control is also accomplished with small thrusters located on the SM. 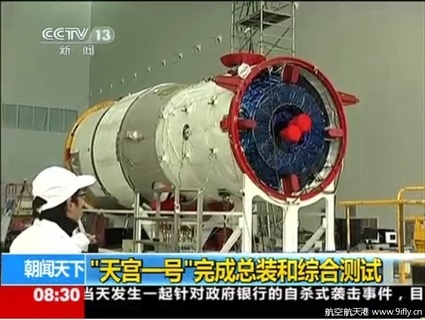 It is presumed that the propellant tanks are identical with those of Shenzhou. Propellants are stored in four 230-Liter Tanks capable of holding 1,000 Kilograms of hypergolic propellants. Tank pressurization is accomplished via two small 20-Liter high-pressure gas tanks. The Orbital Module is 3.35 meters in diameter and 5 meters long. It provides the working and living space for visiting crews and is filled with mission-specific science equipment. The section is outfitted with a heat rejection system using external radiators located in the aft section of the module increasing its diameter to 3.5 meters. 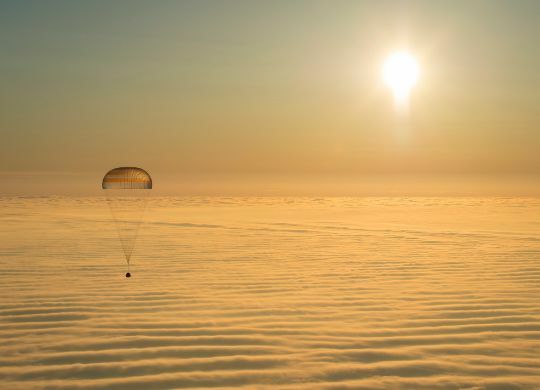 About two Kilowatts of heat generated by internal systems and the crew have to be rejected. The inside of the module uses a a two-color paint scheme representing the ground and sky to help astronauts to maintain their orientation while working inside Tiangong. The interior of the module holds a variety of science equipment that will be used for research by the crew members. High resolution cameras allow Mission Control to observe all on-board operations. Two sleep stations are installed inside the Orbital Module, so that two of three crew members will sleep inside Tiangong while one Taikonaut sleeps inside the docked Shenzhou Spacecraft. 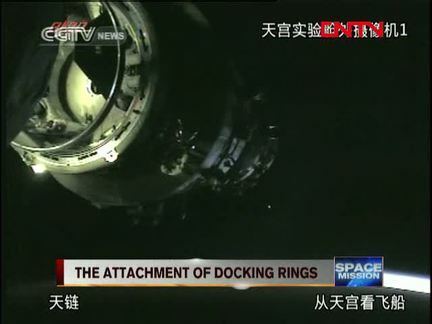 It is believed that Tiangong does not include a toilet facility and on-board kitchen. These will be provided by the Shenzhou vehicle. The Orbital Module includes and APAS Docking System. APAS stands for Androgynous Peripheral Attach System. APAS docking rings can mate with any other APAS Docking ring unlike the traditional probe-and-drogue system. For APAS, one docking system is configured as passive unit while the other fulfills the active part. Once a soft-mate is achieved after contact and relative motion between the two spacecraft has dampened out, latches are closed to form a hard-mate between the interfaces. The Tiangong Docking port also includes state of the art Rendezvous Sensors consisting of radar, laser and optical instruments. It also includes interfaces for transfer of power, data and other resources between docked vehicles and Tiangong.